We’ve been catching up the last few weeks on what some of the Downton Abbey actors have been up to since the series concluded. 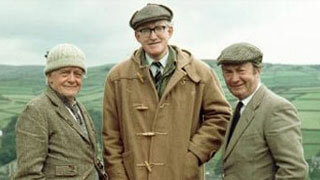 This week, in response to a viewer’s request, we switch gears and turn to the perennial Afternoon Tea favorite, Last of the Summer Wine. The series ran for 35 years and while many of the actors are sadly no longer living, I thought you might enjoy a brief update on some of the surviving cast members. 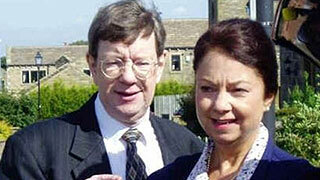 Peter Sallis (Clegg) – This loveable gentleman celebrated his 95 birthday this past February 1st. Since I last wrote about him a couple of years ago there’s been no further updates on his health. You can read about Sallis in this archived article http://afternoontea.mpt.org/tea-time-tidbits/080414/. Jane Freeman (Ivy) – Freeman also recently turned 95 (March 15). Freeman and Sallis are the only two cast members that were with the series from the very first pilot episode. Unlike Sallis though, Freeman didn’t appear in every single episode and her last episode was the penultimate one. Jean Fergusson (Marina) – I wrote quite extensively about Fergusson, who turned 71 last December, a couple of years ago. Here’s a link to the archived article. http://afternoontea.mpt.org/tea-time-tidbits/092214/. What I omitted to mention in the article is that as well as her one woman show portraying comedy legend Hilda Baker, Fergusson also appeared back in 2014 on stage in a British farce by Ray Cooney called Two Into One. 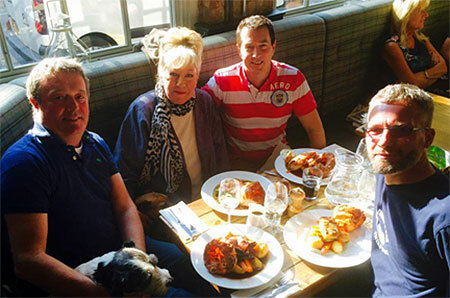 I’m not sure what Fergusson’s been up to lately, but I’m assuming she’s still living in London, as the Wilmington Pub proudly reported that she’d been there for Sunday lunch last fall – as you can see in the photograph, Yorkshire Pudding was on the menu! Juliette Kaplan (Pearl) – When I last wrote about Kaplan at the beginning of 2015, she was hoping that her few appearances in Coronation Street might lead to a permanent role. As of yet that hasn’t happened, which means Kaplan has probably had more time to spend with her beloved granddaughters. It also gave Kaplan time to work on a film and last spring she took second billing in an independent British film short called You Are Whole. It’s a comedy about a guileless missionary who gets mistaken for a serial killer in a sleepy British northern seaside town. Since its release it has been aired at film festivals all over the world and continues to be screened at festivals this year as well. Here’s the link to my archived article about Kaplan, http://afternoontea.mpt.org/tea-time-tidbits/060115/. I’ll have more next week on what the surviving cast members of LOTSW have, or haven’t, been up to since the show ended. In the meantime, you can see them in their glory days every weekday afternoon at 1:30pm on Afternoon Tea.